There's sugar in them, but less than in most cookie recipes. The flour is white whole wheat, a 'lighter' 100% whole grain flour that's great for baking, and there are 4 whopping cups of old-fashioned oats packed into the pan. Extra sweetness comes naturally from organic raisins, which are one of the best organic values around. Reasonably priced organic flours and oats can be found in the bulk bins of natural food stores. I stock up and freeze organic butter from Trader Joe's or when it goes on sale at Whole Foods. These bars stand up to packing and traveling, and they won't melt in the heat. Having trouble getting back into that early morning school rush groove? Add a glass of milk and you've got a grab-and-go breakfast that nutritionally beats a donut or a bowl of sugary cereal by at least a couple of grade points. Next time I make these I'm going to try substituting honey for part of the sugar. You could also toss in a cup of chopped nuts for extra protein (you might want to reduce the amount of raisins), or experiment with other dried fruits, like cranberries. I bet some unsweetened coconut mixed in would be nice, too. They aren't much to look at, but they always get rave reviews. They also require less kitchen time than baking several trays of cookies. All in all, I'd give them an A+. Now if only all homework were this easy. When I arrived home in mid July after my week long snake bite stay at the hospital, my urge to declutter everything around me was stronger than ever, probably because I was suddenly spending all of my time indoors. But since I couldn't get around without a walker, dealing with the physical mess wasn't an option. So I turned to my computer and went on a massive inbox clearing campaign instead. I never realized how many newsletters and notices I deleted without reading as soon as they arrived. I unsubscribed like crazy, getting rid of everything but the important stuff, like the Martha Stewart Cookie of the Day. This recipe was inspired by one that arrived a while back in my inbox. I mix these up in a large stainless steel bowl which I place directly over a low flame on a gas stovetop burner to melt the butter. This is a very thick batter; depending on your oats and flour (all brands vary), you may need to add a little more milk. You can simply grease the baking pan instead of lining it with unbleached parchment paper (which is wonderful stuff), but being able to lift the entire contents out of the pan makes cutting up the bars much easier—and keeps you from scratching up your pan. As always, I urge you to seek out local and organic ingredients; they really do make a difference. Real farm eggs taste—and look—amazing. Freshly grated nutmeg is an inexpensive gourmet pleasure; whole nutmeg stays good for years, and nutmeg graters are so cute. 1. Heat the oven to 350°. Butter a 9"x13" baking pan (I love my Chicago Metallic commercial pans). Line the bottom with unbleached parchment paper, leaving a few inches of overhang on the two long sides. 2. In a really big bowl, combine the melted butter and brown sugar (I use a large rubber spatula). Add the eggs, milk, and vanilla and mix well. Stir in the salt, baking soda, cinnamon, and nutmeg. 3. Add the white whole wheat flour, oats, and raisins and stir to combine, adding a little more milk if the batter is too thick to stir. Sometimes I use my hands to help mix in the raisins. 4. Pat the batter into the prepared pan, and bake until the edges are starting to brown and a toothpick inserted in the center comes out with moist crumbs attached, about 25 to 30 minutes. 5. Let cool completely in the pan. Using the parchment paper overhang, carefully lift the entire pan of bars onto a work surface; cut into 24 bars. Store in an airtight container for two or three days or freeze. © FarmgirlFare.com, the all done with homework for good foodie farm blog where it's so nice to wake up on the day after Labor Day and not have to worry about a sunburn, a hangover, or being late for class—just being late with the treat bucket. As a teacher, I need an afternoon snack just as much as the kids do, and these sound perfect! 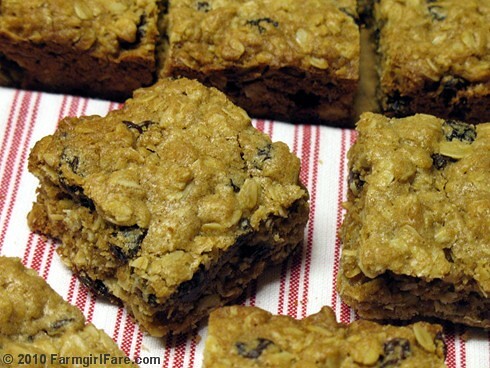 My husband, who loves oatmeal cookies, wants me to bake these right quick !~! Thank you for all your wonderful recipes--I'll be trying this one this weekend. I'm always looking for somewhat healthy breakfast options for three boys (two little and one not so little) who aren't big breakfast eaters! Thanks again! I love your recipes. I have a question. Where to you have a Whole Foods near you to get organic butter? I knew we could get you to cross over! 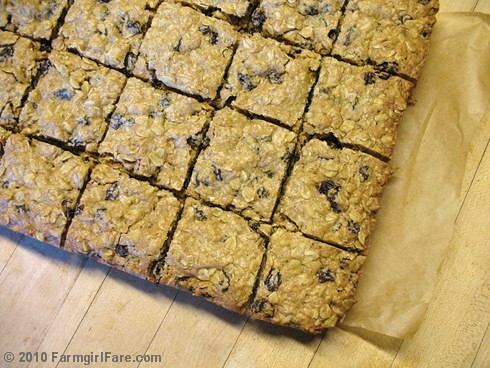 LOL, my original intro for this post was all about how much men LOVE oatmeal raisin cookies! I'm so glad you're enjoying my recipes. I hope you'll come back and let us know what the boys thought of this one. I'm notoriously bad about eating breakfast - I just get up and start going, then realize several hours later I haven't eaten yet. I'm also bad about just grabbing the most convenient thing for breakfast, even if it's a hunk of chocolate cake. Having these on hand has definitely helped! Great to hear you're enjoying my recipes, too. As for Whole Foods, unfortunately the closest one is about 200 miles away. But we make periodic treks to the city to buy supplies, and I always stop by. A lot of their prices on bulk and everyday pantry staples are really good, and their sales can be great. A few months ago they had my favorite brand of butter, Organic Valley, on sale for $2.50 a pound, and I think I ended up buying 20 pounds. It lasts for a long time in the freezer, so it's a great 'stock up' item. Now that (I can't believe I'm going to say this) the holiday season is fast approaching, you'll probably be able to find organic butter - and other baking staples - on sale. 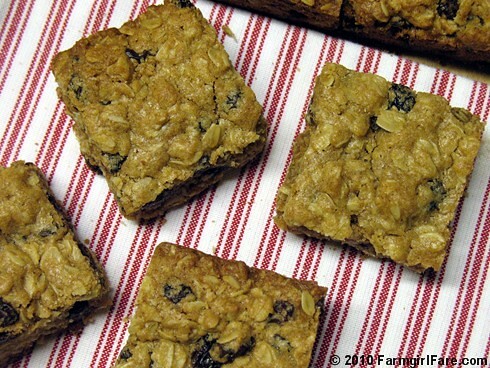 I made them, substituting almonds and dried cranberries. They turned out great! These look so tasty good! I have been wanting to try making a snack-appropriate cookie, and these look perfect. Can't wait to try it out! Thanks for sharing! they won't melt ,so they are great add for picnics. Thanks for this post and for your lovely blog !